In a move to usher in an ambience favourable to women empowerment, Chief Minister Sarbananda Sonowal on Wednesday inaugurated a proceeding of giving financial aid to women Self Help Groups (SHGs) by handing over cheques worth Rs. 25,000 each to 15 SHGs at a Mahila Samaroh held at Kamalakanta Kshetra in Biswanath. The Mahila Samaroh was organised as a part of Kanaklata Mahila Sabalikaran Achoni wherein by handing over cheques to 15 SHGs, Sonowal started the process of granting financial aids to more than 11057 SHGs in Tezpur Lok Sabha Constituency consisting of eight legislative assembly constituencies. 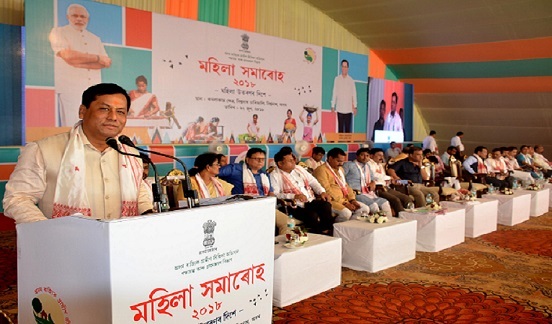 Addressing a huge gathering, Chief Minister Sonowal said under state government’s visionary programme ‘Kanaklata Mahila Sabalikaran Achoni’ the government is committed to render financial help to all the 1 lakh 30 thousand SGHs in the state. He at the same time appealed to the members of the SHGs to make the judicious use of the financial grants to bolster their empowerment. Sonowal also said the state government has given unprecedented importance to women empowerment because it (government) sincerely believes that empowerment of woman leads to empowerment of a family, which leads to empowerment of society, leading to empowerment of a state and nation. Terming the women as friend, philosopher, guide and reformer, Chief Minister Sonowol said the entire state looks towards the huge untapped power of women as a force multiplier to rural economy. “If the vast resources of women at the rural areas are used effectively, rural economy of the state can be given a huge momentum”, Sonowal added. He said the SHGs that can exhibit exemplary results in their endeavour would be awarded Rs. 5 lakh, Rs. 3 lakh and Rs 2 lakh respectively. Chief Minister Sonowal also asked the women folk of the state to maintain a close watch on the performance of the state government and help it for the successful implementation of the welfare schemes in the state. Terming them as role model, Sonowal also appealed them to take the role of a precursor to wipe out superstitions from the society. Health and Family Welfare Minister Dr Himanta Biswa Sarma while speaking on the occasion said the state government will empower the SHGs and the financial aid would be increased to the tune of Rs. 5 lakh. Earlier, Panchayat and Rural Development Minister Naba Kumar Doley, Labour Minister Pallab Lochan Das, MP Tezpur RP Sarma, former Speaker of Assam Legislative Assembly Ranjeet Kumar Dass, Deputy Mayor of Guwahati Municipal Corporation Bijuli Kalita Medhi spoke on the occasion. MLAs Promod Borkotoky, Ganesh Limbu, Utpal Bora, Ashok Singhal, Brindaban Goswami, Chairperson Assam State Social Welfare Board Krishna Das and a host of dignitaries were present on the occasion.